Alfa Romeo There is 1 product. Top Hydraulics is the world's leading rebuilder of convertible top hydraulics - far exceeding OEM specs, and new, upgraded hoses are always in stock. 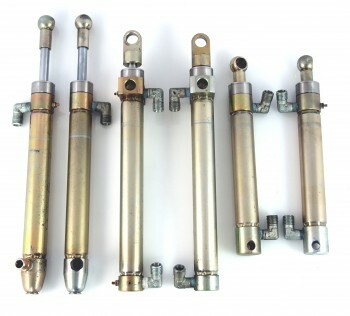 Top Hydraulics' quality is unmatched! We upgrade your cylinder(s) by replacing the tiny OEM rod seal with a much larger one made of superior materials, and adding custom caps made of CNC machined stainless steel to accommodate these superior seals. Our seals are not sensitive to water and are resistant to most additives in hydraulic fluid. This results in a much longer service life than the standard OEM cylinders for a fraction of the price. Top Hydraulics also rebuilds and upgrades convertible hydraulic pumps, as well as manufacturing our own upgraded hydraulic lines.